….. 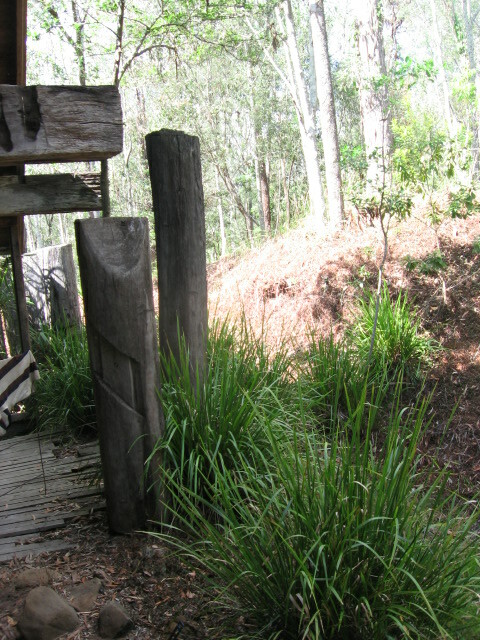 Timber Gate Entry …. Having a timber gate entry is very important. Having an entry creates a sense of the differences between the more open spaces …. 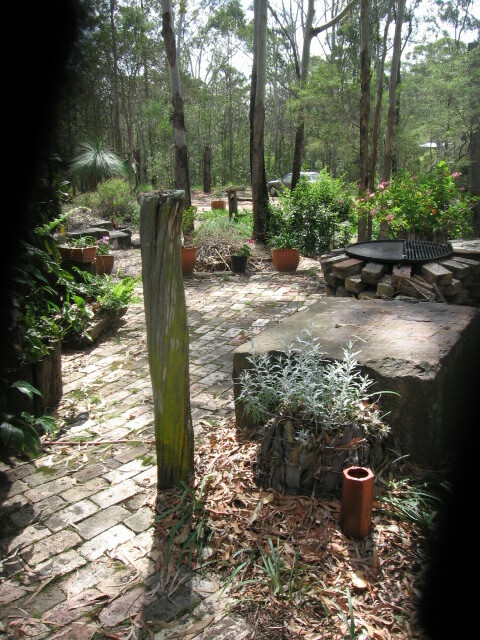 parking area and the park-like effect of the lower bush area and the more confined spaces of the garden and the house. As you go through the gate entry, you enter a more personal space. The personal space is one of a series of interconnecting garden rooms. Each garden room has a different function but it creates a real sense of belonging. It may not be an open space but it has sense of unity different to the next garden room. Several years ago we installed a defined garden entry point by using a big curved metal arch. It had been in for about three years and we came home one day to find the arch rusted and spread out on the stone paving leading into the house. We knew we had to install something more solid and permanent. We asked next week when were at our local church, a friend Matt who had a carpentry background, if he could do it next weekend as it was his day off from his normal work. This was using our ample demolition timber on up our land. He said he could do it. He came out with some simple tools in his car: a chainsaw, a hand soil borer, a shovel and a crowbar. He also came out with his small son to look on. 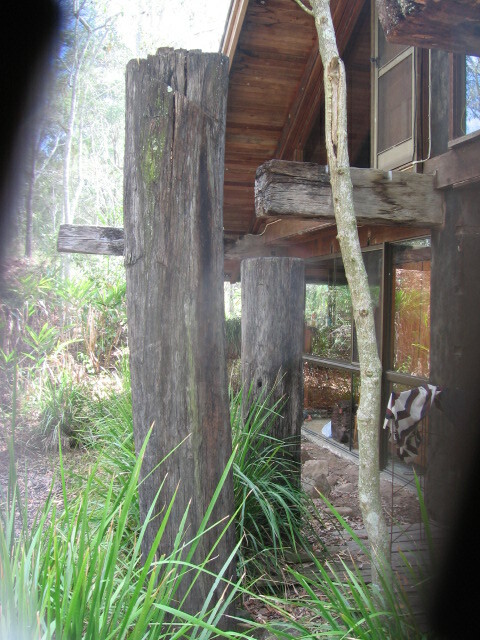 I showed him the demolition timber up on our land and went through the intended design for the garden entry using two big vertical posts and a big flat piece on the top. I left him to it and left our wheelbarrow for him to use. Matt selected out two big posts, loaded them onto the wheelbarrow and individually wheeled them down the 100 meters down the hill along our exit driveway to the gate entry point. He was a strong man !! He never would have lifted the heavy flat top by himself or even with two people. Two people would have to have been up on ladders balancing a big piece of timber between two people. Matt did it successfully all by himself !! When he had finished, we offered to pay for his time. ”No” was his answer … he did it free of cost to us as his friends. We were so blessed to have such a solid gate entry. After enjoying coming through this gate entry for a year, Harriet suggested ”why not plant a climbing rose over this gate entry”. 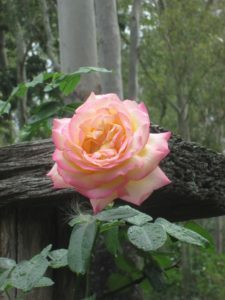 We went out to a local nursery and selected two climbing roses. I planted them and nailed some big nails into the big flat timber on top. If the roses grew to this point, they could be securely fixed so they would not falling down in your face as you walked through. After a year, the result is seen below. 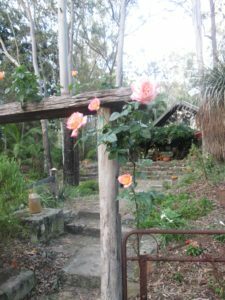 Four big rose flowers on the righthand side alone to greet you as come into our house !! edges of a Garden Room outside our bedroom which looks down into our bedroom pond ……..
A piece of old post and rail fence. To obtain this is a very rare thing. When settlers came out in the late 1880’s into the dry Australian bush, they wanted to clear the land of trees and create open space for their cattle. They split the trees with wedges to form horizontal rails and bigger posts to go in the ground. A narrow axe was used to cut slots for the rails to go into. The big stone to the left of the fence has a personal story to tell in itself. When our two children (Anthony and Claire) where little back in the mid 1980’s, we would have birthday parties for them and their friends. 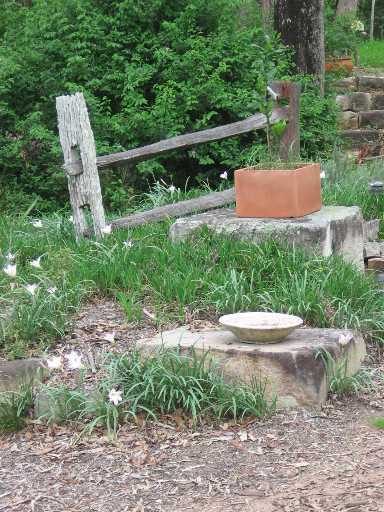 This stone would be covered with a nice white cloth and used as a birthday table. I originally obtained this stone plus two truckloads virtually for nothing in 1981. At the time of our building the house, I was passing one day in 1981 down near the corner of Albert and Margaret St. near the Brisbane Botanical Gardens. I was with my landscape contract business partner at the time, in our truck. We passed a corner block with a big pile of earth and square cut stone. There was a big drott working on the site. We stopped the truck and I went over and asked the driver what he was going to with the stone. 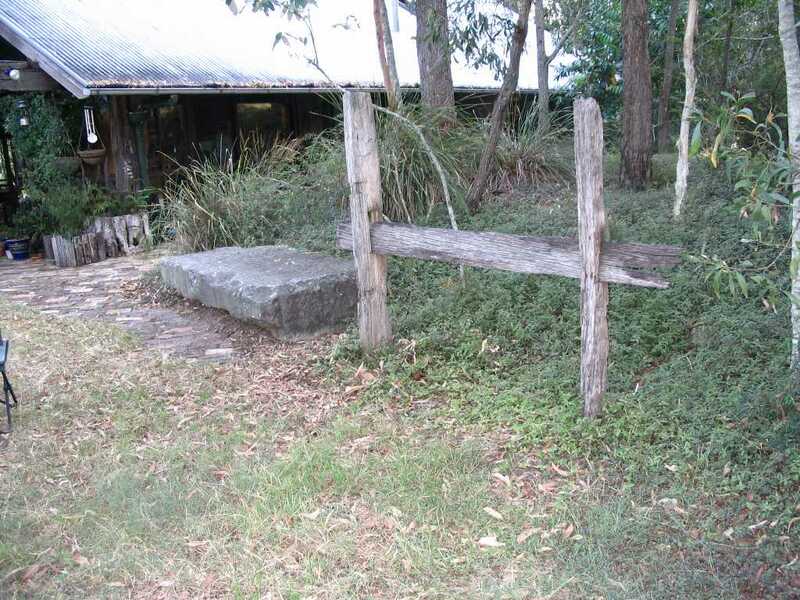 It was from the foundations of the old Cobb and Co. Depot in the Stagecoach days of Brisbane. We were in the middle of building our house. I said to driver, `What do you going to do with the stones?’. He scratched his head and said `I will probably dump them’. `How much do you want for them?’ I asked as the inveterate scrounger. He said `Probably $50.00’. I said `I will give you $75.00 for the lot’. I paid him then and there and had him load on one load of dirty stone. We came back the next day to collect the other load. This is how you recycle waste materials or scrap into useful and very valuable items. Those stones became the main wall in our bedroom and also initially one large one as an inside coffee table. This was a handcut stone 1200 mm. long * 55 mm. wide * 33 mm. deep. One forms the big stone table as shown above. In the last three years, the rooms in the house have been redesigned so that now what was initially a dining room has become a small sitting room with the TV and DVD sitting on the raised stone. The stone was moved by hand on bricks and a crowbar with two of us working on the moving of the stone some fifteen metres from one place to the other. With recent research in the John Oxley Library, I have since found out that the Headquarters of Cobb and Co. were at 71 Albert St., The City. The Company had moved headquarters in 1866 from Melbourne. 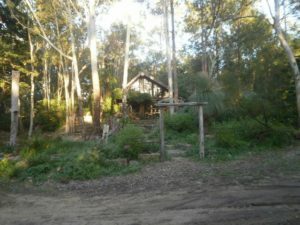 It had initially been formed to run from Melbourne to the Victorian Goldfields. It was in operation in Brisbane for seventy years till 1924. It didn’t survive the Great Depression and caused the Company to go into voluntary liquidation. Competition from rail and the newly invented motor vehicle, had also produced a contracting of the extensive mailruns which ran all over Queensland and down south. At these new headquarters, there were large offices, a coach building factory and stables for the team of horses which drew the coaches. In 1866, the coach building business, was moved to Charleville. 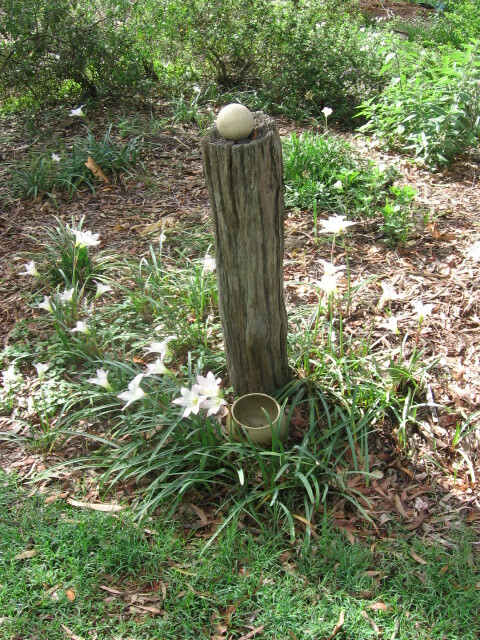 It is wonderful to know our stone has been part of early Brisbane history.